A MASQUERADE BALL- Unmasking The Future. 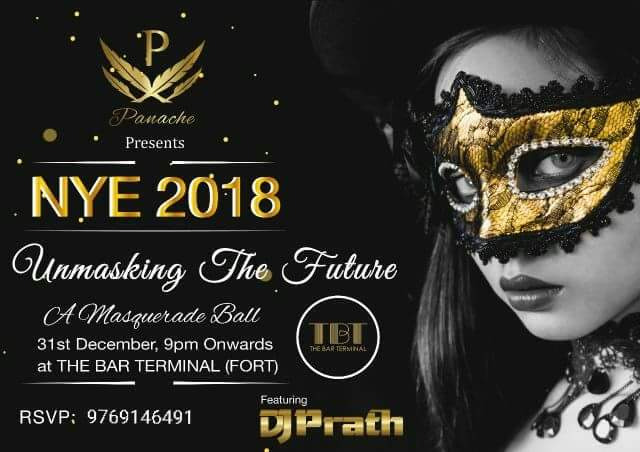 Panache Presents New Year Eve 2018 !! “A Masquerade Ball” - Unmasking The Future. From a sparkly look to a feathered fashion, the masquerade masks are the perfect New year Eve look. Dress up & mask on as we take your new year celebration to next level. Doors open 9 pm. onwards. Venue :- The Bar Terminal (Fort). (UNLIMITED DOMESTIC LIQUOR , COCKTAILS , MOCKTAILS , STARTERS & FOOD. Table Reservations Have Been Started. We are strolling in 2018, Are you?